Sometimes things don't go your way. Whether it's coming home from a bad meeting at work, getting stuck in a 10-mile traffic jam or finding out that the waiter just gave you the completely wrong dinner, there are a million little things that can go wrong and make it seem like your day has been ruined. Of course, as a dad, it's important to keep this anger and frustration away from your impressionable young children. Children are like sponges and tend to absorb tendencies and behavior that you display in front of them. It's this principle that fuels the "lead by example" parenting mantra for encouraging good and respectful behavior in your kids. Just as you can teach patience and understanding by remaining calm in a stressful situation, children will likely pick up on overreacting and yelling should you lose your cool. Anger management doesn't mean ignoring your frustration or stress, it simply means finding a way to deal with it in sensible terms. For example, if you find yourself becoming angry with a restaurant waiter during a family meal, try taking the person aside and explaining the situation calmly and carefully. Exploding into a fit of yelling in front of your children may change their entire perception of you (dad – the ultimate cool customer) and subconsciously teach them that yelling at someone in public is acceptable behavior. Sometimes, you may find that your children may be the cause of your frustration – a messy bedroom, unfinished homework or playing too loudly in the house. In these circumstances, you will need to determine an appropriate response to the violation committed. 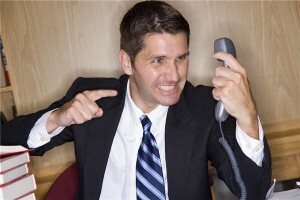 Will these situations make you angry? Of course. Still, raising one's voice and yelling in order to make a point isn't always the answer. Use your discretion, but remember to consider the consequences of your actions in the long-run.